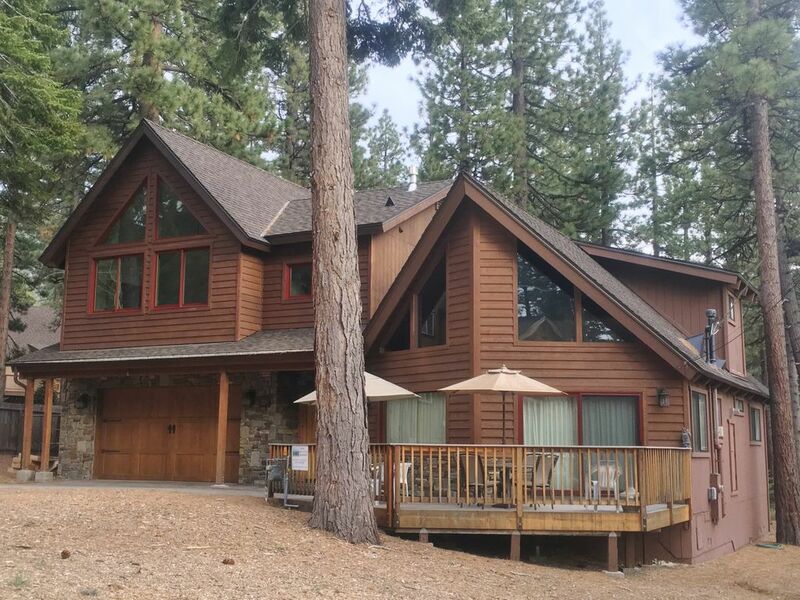 Family friendly, cozy, recently remodeled, two-story chalet with open beam knotty-pine ceilings, granite floor entry, and carpet throughout. Comes fully furnished with Free Hi-Speed Cable & Wi-Fi Computer access, linens, kitchen utensils, and cookware. Enjoy the beautiful new kitchen and rock fireplace with newly installed gas fireplace insert, 40' HD-Cable TV, and driveway parking for two additional cars. Trex front deck with patio furniture, Gas BBQ and views of the Sierras. Games, puzzles, video tapes/DVDs provided. A small snow sled hill behind the chalet makes winter-time fun, safe and enjoyable for the kids. Large 2-car garage with key-less entry keeps your car out of the cold and snow. *** Living Area above garage is always unoccupied and not included with the rental of this chalet. Heidi enjoys snowshoeing near chalet at Lake Tahoe. After vacationing in beautiful Lake Tahoe for 15 years, we decided that Tahoe was always going to be a special place for our family to enjoy for years to come. We started by staying in hotels, then purchased a timeshare that we used throughout the year. Finally, we decided to find a home in a quiet, forested neighborhood, away from city noise, but close enough to enjoy the great Lake Tahoe ammenities: water, casinos, and skiing, without having to drive very far. Montgomery Estates was the answer, and we have loved vacationing here ever since. Check it out, and you'll see why this is such a special place in Lake Tahoe! toilet, shower, New Tile Shower and Floor. Fully-furnished with towels, washcloths and soaps. Full-size Washer and Dryer located in downstairs bathroom. Level floor entry into downstairs shower (no threshold). Grab bar present in shower. Wireless phones located in living room and each bedroom. Forced-air heating throughout Chalet and from the fireplace insert located in the living room. Cozy large rock fireplace in the living room with newly installed, thermostatically-controlled gas fireplace insert. Fully enclosed,wireless remote, two-car garage with direct access into chalet. Full-length Couch, 2-Person Recliner Love Seat, Large, wall-mounted, remote, HD TV. Knotty-pine coffee table and end tables make for a cozy cabin experience. Built-in over stove. Has auto settings with turn-table feature. Newly remodeled with knotty alder cabinets and granite counter-tops. Can ceiling lights with Pendant lighting over counter. Large oak table with seating for 8. Trex Deck with 2 Patio Dining Sets and Umbrellas for seating of 8. Community course located within 3 miles. We had a wonderful time in this South Lake Tahoe chalet. Just a few miles from Heavenly; but tucked away in a beautiful quite neighborhood. This home had everything we needed for our kids and grandkids to have fun & enjoy the snow. From the comfortable beds, cozy fireplace & heated floors in the downstairs bathroom it was a pleasure. There was plenty of room for our grandchildren to go sledding and build a snowman; with us watching them from all the windows in the home when we weren’t outside with them. Thank you Dan and Heidi for sharing your home with us. I’m hoping to get everyone together this summer and hopefully enjoying your home again! We absolutely loved our stay. The house was clean and had everything we needed. Fit my family of 6 perfectly. The boys could play in the front and I could see them playing without having to be in the snow with them. Great location. Can’t wait to go back. Thanks again Dan and Heidi for letting us stay at your home. Magical and super clean and comfy! We had an amazing time Heidi was so helpful since we book our stay! We had a great adventure! there was so much snow that we ended staying another night, Tahoe was cover with snow ! The house was super clean and had everything we needed to cook, the rooms big enough for a family of 8 and the beds super comfy! Heidi was such a blessing In our stay she was available for what we needed! This cabin was just magical ! Perfect for snow days we ended staying another day due witch it was all worth it , the neighborhood was great ! If you are looking for a place to good to be true you must book this cabin you won’t regret it ! This was in winter I could just imagine my stay there in summer ! Me and my family will come back again ! My prayers that this world has more good people like the owners of this cabin Heidi was a big blessing for all of our family ! First time in Tahoe and my experience was just like a dream come true ! Beautiful, cozy cabin. Everything was clean when we arrived. Fit 7 people comfortably. Lots of beds, and the couches were very comfortable. The TV/cable had a lot of channels, and WiFi was strong and stable. I appreciated the Nest thermostat which was easy to use. The chalet was located in a great neighborhood. My little nephew enjoyed the mini sledding area in the back. Heavenly was only 10 minutes away, which was very nice. Dan and Heidi were very friendly and great hosts. Overall perfect experience! Would definitely book again. ATV/Snowmobile/Hiking Trails, Skiing, Skateboard Park, & Disc Golf, All Nearby! Christmas / New Year's Weekly rental:(free cleaning). Minimum Age Limit for Renters Fully-refundable Security Deposit: $350.00. Check, Credit card (via Homeaway).